Click the button below to email your resume to Laura Covello, Executive Director. 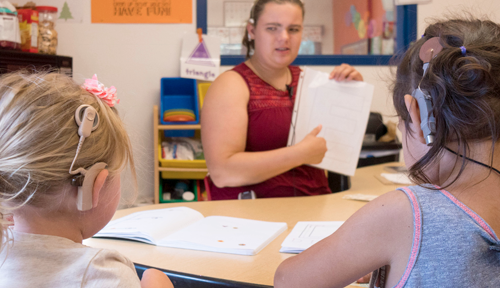 At the CCHAT Center, we offer professional development courses taught by industry leading speech language pathologists, teachers of the deaf, AG BELL Listening and Spoken Language Specialists (LSLS) and audiologists who specialize in working with children who are deaf or hard of hearing. Certified by the Continuing Education Board (CEB) of the American Speech-Language-Hearing Association (ASHA), our courses provide high quality instruction in those subjects that matter most to speech pathologists, language therapists, and audiologists – especially those who treat younger patients. No upcoming courses, check back soon! Please be advised that if you’re requesting continuing education credit for speech-language pathology or audiology, you’ll be required to sign in and out of the course. In addition, you will also need to complete a learner assessment form. Complete the CCHAT event registration by or before the conference deadline. State the special need or specific accommodation in the Comments & Other Info section of the registration form. You can also communicate any needs or requests by contacting us directly – prior to enrolling. Unless otherwise indicated, refund requests must be received (in writing) at least 15 days prior to the beginning of the course or event. These written requests can be sent by post, email or fax to CCHAT Center Continuing Education and Professional Development Division. We reserve the right to cancel a course or event when circumstances warrant, including for inclement weather or because of insufficient registrations. In the event of a cancellation or postponement, each registrant will receive written notification and a full refund. While people with hearing loss may greatly benefit from cochlear implants, hearing aids, and assistive listening devices, CCHAT does not endorse or represent any specific company, vendor, supplier, or manufacturer. Reference herein to any specific commercial products, process, or service by trade name, trademark, manufacturer, or otherwise does not necessarily constitute or imply its endorsement, recommendation, or favor by the CCHAT Center. Continuing education opportunities shall not be used for advertising or product endorsement purposes. Parents and professionals are encouraged to fully investigate any potential hearing aid, cochlear implant, assistive listening device, or provider that may be most appropriate for that child or patient. Any questions, concerns, or complaints about continuing education courses offered by the CCHAT Center can be sent by post, email or fax to the CCHAT Center Continuing Education and Professional Development Division. The Continuing Education Administrator will review all questions and complaints before sending back a response in writing. Please use the following contact information for all correspondence. A referral from a doctor is not necessary, but referrals are always welcome. To schedule your appointment, please call 916-361-7290. If you have additional questions about our continue education courses – or if you wish to join our next intake – schedule a consultation with us today.